This review forms part of my contribution to the Australian Women Writers 2012 Reading Challenge. All my 2012 AWWC reviews can be found here. 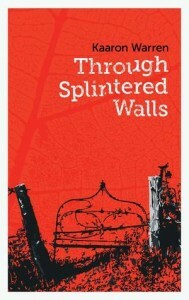 Through Splintered Walls is a disturbing collection, which uses an Australian backdrop and seemingly mundane settings and twists them quite savagely in parts. The supernatural elements of all four stories tend towards understatement, with the real horror coming from the behaviour of the characters. The first three stories (Mountain, Creek and Road) are very short, with the fourth story (Sky) more like novella length and taking up by far the bulk of the book. Mountain tells the tale of a middle aged woman trapped in a bad domestic situation, encouraged by a ghost to attempt to break the cycle. I enjoyed the non linear nature of the narrative, and the focus on building the protagonist’s character in such a short piece to the point where you entirely believe the choices she makes towards the end. 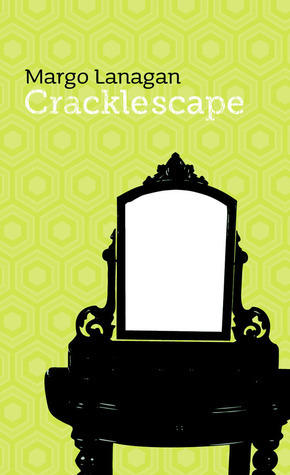 Creek is a haunting tale of a woman searching for the supernatural cause of a childhood trauma. The protagonist’s inability to form meaningful connections in her life was more tragic than the supernatural elements, again a lovely character piece. There is a line towards the end that mentions nephews and nieces (I won’t quote it in case it spoils anything for anyone) – that line was one of the saddest lines in the book for me, a quite poignant moment of self awareness for the character. Road is a short piece about an old couple maintaining a refuge for the spirits of road accident victims. Well constructed and written, but it didn’t have the same emotional impact for me as the other stories in the book. Sky is the longest piece. The story centres mainly around Zed, a nasty piece of work who in a rare moment of guilt decides to try and find out what happened to a childhood school teacher who disappeared years before. His searching leads him to the town of Sky, where being unemployed is not a healthy way of life. The first few parts of the story move between different point of view characters, which could be disorienting but in this case works really well to build some background to the main story. When we settle on Zed (who provides the point of view for most of the novella) we already have a good sense of him from an external perspective. The switch to first person narrative was an effective way of showing that we were with the “main” point of view character. There aren’t really any sympathetic characters in the story, but the writing was compelling enough to keep me engaged throughout. The view from inside Zed’s head was particularly well done, with the self justification and self centred nature of a bully and possibly a psychopath drawn out effectively. The switching between Sky and Canberra as contrasting locations was effective, although my enjoyment of the characterisation of Canberra was probably assisted by my living there for a few years in the early 2000’s. The contrast of the city vs country cultures was also drawn out well. In many ways Sky reminds me of the novella Wives by Paul Haines in terms of sensibility, unlikeable characters and powerful story telling (although the writing styles are quite different). I found it to be a powerful and memorable piece of writing. I’ve enjoyed the whole Twelve Planets collection so far, and Through Splintered Walls is another fantastic addition to the series.